The show today opens with Rinapuu asking Meimi what marks the start of winter for her, as it’s starting to get chilly during the morning and evening. Meimi begins to describe the cool winter breeze blowing into her room and sparkling in the morning in a very dream-like voice, which freaks Rinapuu out: “Please go back to normal,” she asks, before Meimi starts singing out of nowhere. “Please be quiet, the listeners–“ Rinapuu tries to stop her but it’s too late, Meimi is in her own world now. It turns out that it’s the final day of Wicked in Japan and Meimi is doing her best Glinda impression as a result. Rinapuu doesn’t know who that is, but she does know that Elphaba is the name of one of the characters although she’s not sure which one (“The green one?”). Since it’s November, the discussion opens up on campus festivals, which normally occur during this time of year. These festivals are what the name implies, they’re essentially carnivals on university campuses with lots of food and games hosted by different school clubs and their are music and dance showcases for the students, and usually the school books some musical acts to perform. Rinapuu, not a college student, remembers that they performed at one festival last year and it was kind of a surreal experience. Normally they have lots of fans that show up wherever they go, but their typical wota behavior like jumping or dancing isn’t exactly encouraged at these sorts of events, especially if they aren’t students, they had to rely on the reactions of the students who were there instead. They were all really worried about how they would react since they’re not college students and still rather young by comparison, but it ended up being really fun and the crowd was very supportive. Who would ever guess she’s not a college student? Meimi, also not a college student, says that she went to one once with Kanyon and Kananan when they had time to hang out. It was incredibly fun, so much so that she didn’t want to go home. Rinapuu wants to try working at festival or a theme park, as well. In particular, she wants to be that one person who always waves and says “have fun!” in kind of a sarcastic way at the front of haunted houses or roller coasters. You know the one. I think it suits her. They take a moment to reflect on the past two shows, in which all of the 2nd gen members were present. Rinapuu says it was a whole lot of fun and it made her appreciate the radio show even more, because she’s not sure there would be too many other opportunities to showcase how all 4 of them interact together otherwise. Meimi has a bit of a complaint, though: they were set up in a room to record where they really couldn’t see each other too well, and she thinks it would have been more fun to be able to see everyone’s faces as they talked. Rinapuu points out that this is rude to the staff who let all 4 of them get together in the first place and besides, if they could see everyone’s faces they probably would have laughed too much to actually record any talking. The discussion starts off today with the question, “What is culture?” Kananan responds quickly with, “Japanese food, Japanese clothes, Japanese art… which means Wada-san!” Takechan is incredibly impressed and asks her if she looked this up beforehand. She did, of course, but all of this was just an elaborate segue to talk about everyone’s favorite leader, Dawa. Meimi says that she has made plans with Dawa to share their respective hobbies. They went to see Wicked together (since there are few things Meimi loves more than Wicked) and they’ve been talking about visiting different temples together. Takechan, on the other hand, reports that she made a bet for the winner of a Central Baseball League game and her team lost, although she wants everyone to know it was a very, very close game. As a punishment, she has to make a written report of her thoughts on Dawa’s book, A Maiden’s Guide to Paintings. She has not started yet. Rinapuu says that Dawa recently bought her and Takechan some Harry Potter merchandise since their both such big fans. Meimi begins to pout, “She didn’t get me anything…” Kananan points out that earlier when Dawa was out with Meimi, though, they met up with Kananan and took purikura without Rinapuu or Takechan, so it evens out. Moving on, Takechan asks if anyone has done anything interesting lately. Meimi immediately chimes in with, “Religious study!” Yes, this is true: Meimi went on her own personal time out to a temple to do a day of training with the monks. Rinapuu thinks this is weird, but Kananan might like to go and try it once. Meimi says it was really intense, as she ran so much she thought her legs would give out and they hiked so far she couldn’t breathe and then she did some waterfall mediation. She was about to give up halfway through but then she realized she might never get the opportunity to do waterfall meditation ever again so she gave it a go. She thinks that if she had stuck with it she really might have considered becoming a monk. While her generation-mates sway her away from the path of a monk, Meimi informs us that she did take away something very important from the experience and that is gratitude. She ate a meal with the monks and said that they spend a long time doing prayers before eating and always make sure to express their thanks for receiving anything. 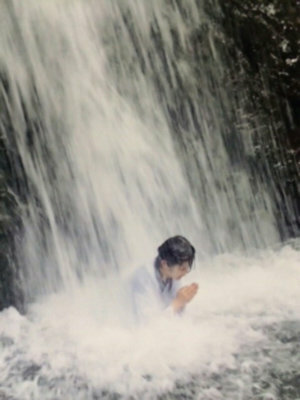 She emphasizes how difficult the waterfall meditation was, though, as it was very chilly and she can’t imagine doing it in February like the monks do. She also notes how very few women ever do the hike up to the waterfall so she feels special for being able to do it. Takechan doesn’t think that first year high school students ever do anything like that, either, and mentions how strange Meimi is. It’s Power-up Week for Radio Nippon, which means that this is a special show. It’s special in that hosts Takechan and Rinapuu have invited some special guests to join them in the recording booth today. Who are they? It’s a surprise. Rinapuu gives us a hint that they’re as cute as angels, which means the only answer could possibly Kananan and visual-center of S/mileage Tamura Meimi! Shocking! This leads to a lot of commotion considering Meimi’s opinion of herself on the last show, and so the top 3 beauties edge her out of the conversation. 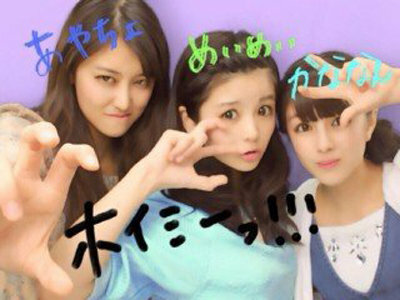 Kananan hopes that her cuteness will adequately be conveyed over the radio and Takechan and Rinapuu thank her for taking time out of her busy schedule to meet with them. Meimi does not get to talk anymore. Song: S/mileage – Samui, ne. This show marks their 90th radio broadcast under S/mileage Station, which means that their 100th show is almost here. Rinapuu thinks it would be cool if they could broadcast the 100th show from a different location or doing something different. Kananan thinks it would be neat to go to a buffet and they wouldn’t talk while getting up to get food and then they’d all come back and eat while talking. Rinapuu says, “…ew.” Kananan then suggests going to Osaka to broadcast, like from Universal Studios Japan. Rinapuu wants to do that and open the show with the Harry Potter theme music while they record from the Harry Potter area. Disney Land would be good too, although they’d have to take breaks to take pictures with the characters. They’ll think about it. They start talking about their play, Smile Fantasy, and how it has been much more difficult than their previous theatrical ventures. This play was actually written for S/mileage and to have them all as the leading actors, so they spend most of their time on the stage and they have way more lines than they’ve ever had before. Despite this, they think it will be delightful for the audience to watch. There is apparently some sort of surprising scene at the end involving Rinapuu that Kananan wasn’t sure she’d be able to pull off and Rinapuu admits she didn’t want to do, but they both think that the audience will really enjoy it. Of course, the opening day of the play is also when the 3rd gen members were announced. They record this show in advance so it’s kind of strange that at the time of the recording they don’t know who will be in the show but at the air date, everyone will know. In any case, Kananan hopes that they can all combine their strength to make an even better group with a new name. The show this week opens with a review of the announcement made this past week in Hello!Station. S/mileage will be adding a 3rd generation of members and their group name will be changing. S/mileage began as four members, 2nd gen joined, then the group continued as 6 members and managed to perform at Nippon Budokan. So that the group can continue to take on new challenges and grow and transform, these changes will be made. 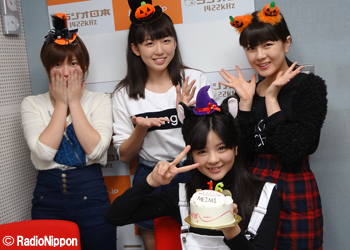 They will continue to work hard as the reborn S/mileage and hope that we will all continue to support them as such. 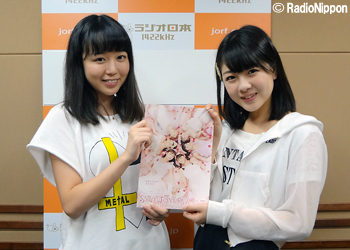 Since this is Radio Nippon’s Power-up Week, they are also going to do a drawing for a copy of their latest single signed by the 2nd gen members and Kanon. They draw a postcard from Yuu, who writes that they are in their last year of middle school and studying for exams and when the going gets tough, they listen to Yattaruchan and study more. Kana and Rina both praise them for being able to study so much to music, because both of them get distracted when they listen to music when they’re trying to work. They do another drawing and draw one from Bambi. Their message asks if it is easy for the S/mileage members to act in the upcoming musical because they are playing roles based off of real people. They both say that it’s actually a lot harder than one might think, because they have to base their performance off of the real person and would be afraid to offend them if they didn’t do it right. In Rina’s case in particular, there are a lot of words and phrases that she just won’t say because she finds them weird, so when they were rehearsing and writing the script they had to make sure that none of those words slipped into the performance. Both Yuu and Bambi will be getting their prizes soon in the mail.